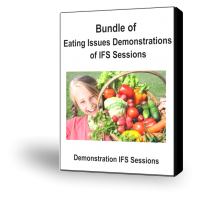 These six demonstrations of therapy sessions with clients with eating-related issues present work with a range of issues that commonly present themselves with clients that have conflicts about food-related behaviors. The first B16 Healing Exiles Protected by Food Controller and Indulger is a touching session with a new IFS client that explores the typical Controller-Indulger polarity and heals three protected exiles. B17 Developing an Inner Champion is an experienced client who wants to activate the Inner Champion aspect of Self. She explores the beliefs of the Controller and the Bag Lady exile that it is protecting. In healing the exile she creates a lovely environment where there are no expectations. Working with Eating Exiles B23 is a particularly touching piece of session where the client contacts exiles related to early feeding experiences. The Hijacker Indulger B24 is with a yoyo dieting client that makes contact with a protective hyjacker developed in her early 20’s around a broken relationship. Getting to Know a Food Controller B25 is a client new to IFS who is just beginning to explore the parts in the eating cluster. Working with a Foggy Part B26 is a wonderful example of a client interacting with this often difficult part to identify and work with.